Wipe down dashboards with baby wipes, to make you car dashboard look like new. Use a soft paint brush to clean grooves etc, on the dashboard. Vacuum in hard to reach places, with a spare piece of hose about 20″. place one end of the hose between thumb and fore-finger and cup your hand over the nozzle of the vacuum cleaner. The hose extension allows you to get into those hard to reach areas down the side of the cars center console. To buff the wax on the car, use a big old soft sock to make a hand mitt. When your windshield starts blurring when you turn the wipers on, dampen a cloth or rag with some full-strength white vinegar and run it down the full length of each blade once or twice. Use WD-40 To help restore a license plate that is beginning to rust. Spray the car plate with WD-40 and wipe clean with a cloth. This will also help prevent more rust from forming. To rid of stale odors from the ventilation ducts, try spraying odor eliminator into the system’s air intake, which is usually located at the base of the windshield. Then run the air conditioner full blast for at least 10 minutes. Tip a couple of drops of essential oil into the ducts to keep your car smelling fresh. To remove built-up acid from the battery, use baking soda and water. Sprinkle baking soda onto battery terminals. Spritz with water to dampen. Let set for about one hour. Sponge off with water and leave to dry. 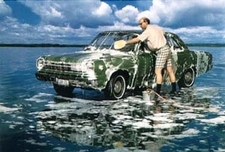 To degrease Engine use ¼ cup washing soda and 1 gallon warm water pour on areas that need degreasing. Rinse thoroughly. Discard any leftovers. To clean the windows follow this tip. To remove scuff marks on the interior side of doors and door sills made by people’s shoes when they get in or out of the car. Try a little vinegar with water let it soak for about 5 mins then wipe off.